Cook the macaroni in boiling water until tender. While the macaroni is cooking, brown the hot dogs in a skillet over medium heat in the olive oil. Remove from pan and set aside. Add butter to hot pan, swirl to melt. Add flour to butter and cook for 1-2 minutes. Pour milk and chicken stock into pan and whisk vigorously until well mixed. Season with onion powder, salt and pepper, and cook until sauce thickens. Turn off heat, then add 2 cups of the cheese. 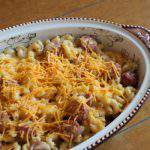 Stir the sauce until cheese has melted, then add hot dogs and drained macaroni and mix well. Transfer to casserole dish. Sprinkle the remaining cheese over top of the casserole. You can melt the cheese under the broiler for 2-3 minutes if desired, or just leave it to melt on its own.